Enjoy this gorgeous, elegant home with stunning views and glass wall overlooking the ocean, just back on the market after renovation! Relax in the balmy breezes as you take in the 180-degree ocean views through breezy floor-to-ceiling windows the length of the ocean-facing side (brand new hurricane windows). Start the morning with coffee and a papaya from your own trees, watching sailboats from the balcony overlooking Buck and Capella Islands and Green Cay. 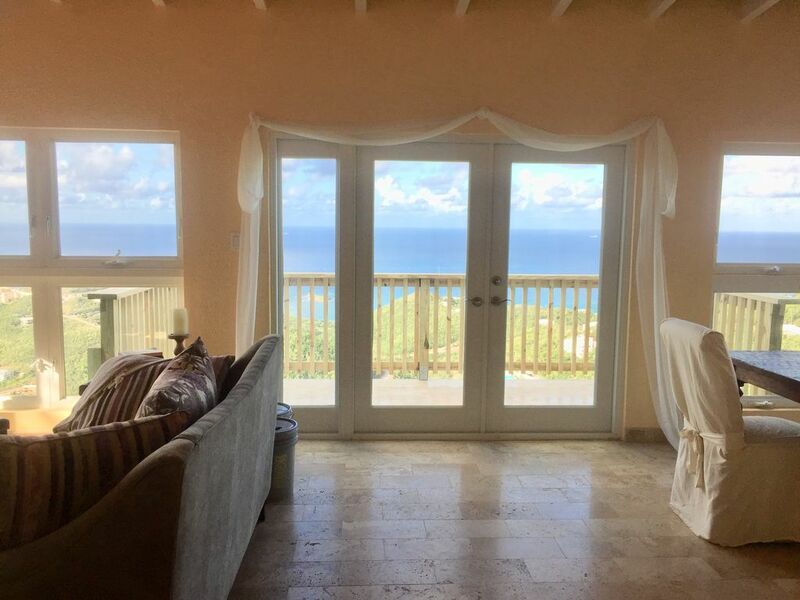 This lovely, light, and airy and beautifully furnished 3-bedroom / 2 bath is appropriate for 1-3 couples and is a 5-minute drive (or a hilly run ;-) from three palm-studded beaches, one with hammocks. You can walk to the beach if you are determined, but you may want to stage a car there (a car is required; it is far above the hustle and bustle of the safari route). With cool-to-the-feet travertine marble throughout, the house has a jacuzzi tub, brand new stainless steel appliances, an outside washer/dryer where you can enjoy the fresh air even while doing laundry, and super high-speed free wifi. There is AC in all the rooms, which you may opt not to use because of the lovely breeze we get being up high on the island. Bedroom 1: The light and airy master bedroom has an ensuite bath, and both these rooms get a flood of golden sunlight in the late afternoon (you’ll think you left the lights on ;-). The queen-size platform bed has a memory mattress with patented cool gel technology. There is an ocean view from the middle of the room; with most of the trees gone in hurricane Irma (they’re being replaced!) you also have a view of the closest neighbor, which you can close out with the touch-lift blinds. Bedroom 2: This elegant center bedroom remains cool and dim all day and has deep floor-length curtains, perfect for those who like to sleep in or take naps on vacation. The queen-size platform bed has a memory mattress with patented cool gel technology. Bedroom 3 is the front room, which has a whitewashed Munich oak platform bed, with the same memory foam CoolGel mattress as the others. This bedroom has 2 double windows and enjoys sunlight and balmy breezes and a sliver of an ocean view past the front porch. It shares a bath with the middle room. Located in a private villa on a private drive, in a secluded area with driveway parking; there is sometimes a tenant in a downstairs 2-bedroom apartment, available to answer questions or help out. Your nice quiet pet is welcome to visit with you, too. You will have the main house and driveway. There are two beaches a 5 minute drive from the house. Bolongo Bay is dog-friendly and has hammocks strung between palm trees, along with two restaurants. Bluebeard's Beach Resort has a life-sized chess board and a pool bar along with a charming small beach and rocky area to climb about and explore. Abi beach has an outdoor bar, Hamptons-style lounges, volleyball, and various games. A car or taxi arrangement is required, as the house is not on the major "safari bus route". There is driveway parking, and a soft-top classic Jeep Wrangler may be available for rent. There are also taxi services on the island. A solo traveler (kayaker, paddleboarder, terrible surfer, skier & snowboarder, rock & mountain climber), I love to see new places, and share my favorite spots with others. The Virgin Islands are a special place, and all the more so after the hurricanes — you are helping us rebuild our island just by coming, and I am excited to share this special place with you! Such gorgeous views off the cliff, and because it’s so high up, it’s so safe and remote-feeling. When I lived here, I never locked the door —in fact it was blocked open for 4 years with a big handmade planter holding a lemon tree! Both bathrooms are travertine marble throughout. The master has a Jacuzzi tub and oiled bronze fittings and the shared bath has an open stone shower with brushed nickel. Fastest WiFi on the island! You have a brand new stainless wall-mounted convection oven and a separate conventional oven. This is an above-the-range convection oven with a microwave function. There will be bottled water, as all the water comes straight from the sky and is stored in cisterns; perfect for bathing and brushing your teeth, but not drinking. Your fully stocked kitchen has brand-new stainless steel appliances, travertine marble counters, Cypress wood cabinets, which were made by hand on the island by local artisans. And pots & pans! 6 steps up to entrance, and bathroom doors 28"
This is a gracious and elegant villa, but also with an island flavor. The wonderful views and island breezes are because it is up an island road – windy, hilly, and bumpy, with an island driveway. You will hear parrots and tree frogs and see iguanas and geckos in the driveway! I know you will enjoy this lovely home away from home as much as I do. My co workers and I needed a place to stay while in usvi, and barb was wonderful to interact with. She gave us directions to the place and walked me through it on the phone for about 20 mins, all while remaining cheerful and upbeat while I was COMPLETELY LOST. (it takes awhile to get used to the island roads) she was very flexible about our dates and accommodating to our special scheduling needs. The property is wonderful we can tell a lot of money and care has been poured into it. The beds are the best!!! The ac is cold and the view is EPIC. I will definitely be bringing friends and family back. I can't wait to rent from barb again!!! Everything that we could have asked for and a whole lot more! What a great way to spend our Christmas vacation. What an incredible view! The house had everything that we needed for a great week. Clean and well maintained. And a great location for everything that we wanted to do for the week. I had a few questions along the way and called Barb. She texted me right back with answers and suggestions. Very much appreciated. A couple things to note. You NEED a car for this house. We had some car reservation issues, so make sure that you reserve, confirm, then confirm and then call to make sure that your car is there for you. Apparently a "reservation" does not actually mean a car will be waiting for you in St Thomas. Once we got thru this, we thoroughly enjoyed our stay at this house. Great location. Close to town and the beaches. I'd highly recommend staying here with your family. Thanks Barb! This home is a dimond in the ruff. It sits atop the highest mountain in Bolongo Bay which is just moments away from Havensight (The Only Nightsceen You Need). Barb was a pleasure, always respecting my privacy. She is a delight to deal with. I highly recommend this rental to anyone looking for a large villa mountaintop with a phenomenal view. I loved having Sean there — he booked the day I started posting photos, paid instantly, and arrived within 2 days — and yes, the road / drive are a bit “ruff”: hilly and windy coming up, with hurricane Irma and Maria reminders scattered about! Halfway between the shopping deals of Charlotte Amalie, the main town on the island (there, find charming bars & restaurants + deals on duty-free jewelry, gems, & French cosmetics & perfumes), and Red Hook on the East End. Located in a quiet private neighborhood on the south coast, Frenchman Bay, just .75 miles off the main road, but feeling very remote as you overlook your own palm trees down to the ocean and island views.